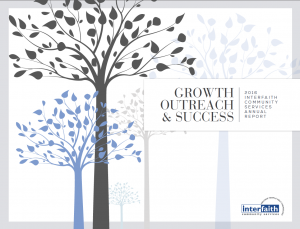 Interfaith Community Services » Our 2015-2016 Annual Report Is Now Available! Our 2015-2016 Annual Report Is Now Available! In case you missed it, we unveiled our new 2015-2016 Annual Report at this past week’s 2016 Annual Meeting! Inside, you’ll see how much our programs and services have grown over the last year, how many community members we served, client testimonials, volunteer & donor support, and much more. Didn’t pick up a copy at the meeting? Click below to view and download your own copy today! Click here to download Interfaith’s 2015-2016 Annual Report.